Welcome back to What Will You Stamp! I have been so excited because this week's stamp set is one of my new favorites! It's From Land to Sea and it's amazing! I had to choose which of the awesome stamps from this set I would use this week... and since I love jellyfish... Here ya go! I heat embossed the jelly fish in white on window sheets and then cut them out. I flipped one over so that I could easily use the image in reverse (thank you window sheets for making this so easy!). The background is water colored in quite a few colors so I will list them at the end of my post. I mounted my jelly fish on Island Indigo and Night of Navy (it looks like black in this pic but it's not-I just have terrible lighting in my house) and embossed a little "love" in the bottom corner. I'm happy with the way it came out and I just can't wait to make more! Here's the whole stamp set... Now you can see why I am so head over heels for it! I can't wait to see what your ideas for this stamp set are!! 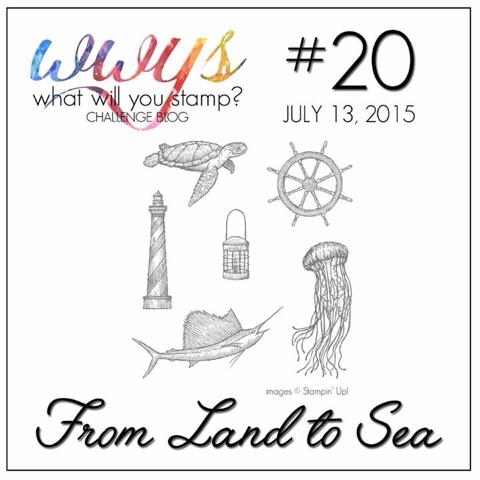 Feel free to submit any of your ideas to the What Will You Stamp challenge blog and earn a shot at being our guest designer! I can't wait to see your creations! OMG Maria! 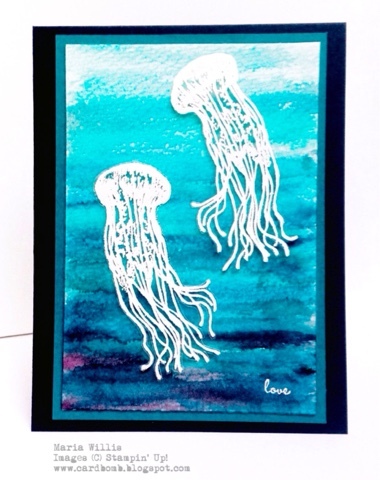 Love, love, love the how you did the jellies! Maria WOW! What a great card you've created!